The creator of Leisure Suit Larry has just unearthed the source codes of several games, including the first two games in the series. He’s put the code on eBay, and interested gamers have already driven the bids into five figures. I’ll wager it’s been a long time since most of us have heard the name “Leisure Suit Larry.” The adult-ish adventure game from the 80s and 90s hasn’t seen a major release in several years, though smaller, Kickstarter-backed remakes and new adventures have popped up from time to time. Series creator Al Lowe is now selling the remnants of his time with the series on eBay, as he said in an interview with YouTuber MetalJesusRocks. Even if you’re not interested in the sale itself, the interview is a fascinating look into gaming’s now-distant past. The source codes themselves are stored on floppy discs — and not the cute, little ones the size of coasters. We’re talking the massive ones that could have been used as dinner plates. If you purchase these, I hope like heck you’ve got a vintage disc reader on your person. 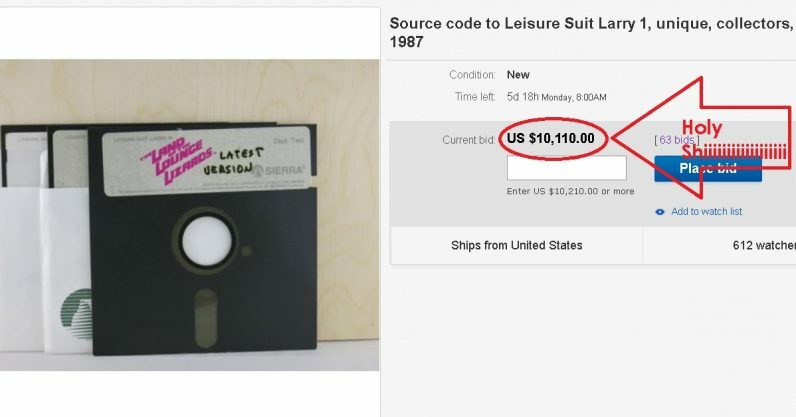 At the time of writing, the bids for the two Leisure Suit Larry source code listings were in excess of $10,000, and with five days left on the clock, there’s potential for the number to reach even higher. We’re not able to see the bidders themselves, but we hope like heck they’re a well-funded gaming museum or a very careful private collector. Realize that, while you’ll have my data as of the day of Larry 1’s creation, you will not own the intellectual property rights to the game, the code, the art, or anything else. Nor do I. The I. P. rights were sold over and over again, until they are now owned by a German game company. But you will have a piece of history that no one else on the planet has. In addition to the LSL discs, he also showed off discs containing the source code for King’s Quest III — the only copy on Earth, according to Lowe. That item, though, is not currently available on his eBay store.